Wind energy and transmission lines are the subject of a lengthy Sunday Kansas City Star article. 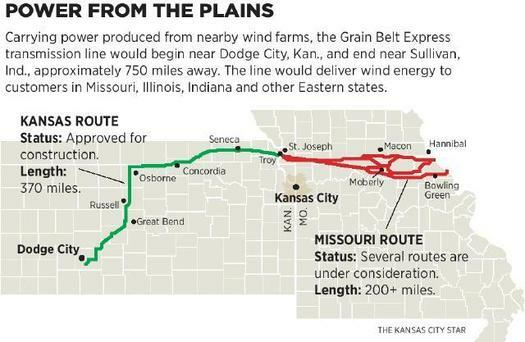 The story looks at plans to build a $2 billion high-voltage transmission lines to carry Kansas wind-generated electricity to Eastern states which requires approval of the Missouri Public Service Commission. The project faces opposition from some Missouri farmers whose property the proposed line would cross. Others support the project as providing a clean energy alternative to coal and creating jobs and economic development. The story also shares information about the potential to generate wind energy in the Midwest.